During the months following Ramadān, Muslims the world over remember the life of the great Prophet, the Friend of Allāh ta‘ālā, Ibrāhīm ‘alayhis salām; a life full of sacrifice and submission to the will of Allāh ta‘ālā. Therefore, everyone who is able to offer Udhiyah should do so and acquire the rewards promised in the aḥādīth. Who is Required to do Udhiyah? The act of Udhiyah is in some cases wājib and in others nafl. A person must perform the wājib Udhiyah and endeavour to perform as many nafl as possible. In the case of the person who, during the days of Udhiyah (10th, 11th and 12th Dhul-Hijjah), possesses wealth to the amount which would make zakāh obligatory upon him, be it in the form of gold, silver, cash, merchandise or any item which is surplus to his needs, the Udhiyah will be wājib. Unlike in the case of zakāh, it is not necessary for this amount of wealth to be in one’s possession for an entire year. The compulsion of Udhiyah is established simply if wealth equivalent to the nisāb of zakāh is possessed during the specified days. Here, we need to clarify certain common misconceptions as regards this ‘ibādah. 1) One common misconception regarding Udhiyah is that it is merely a virtuous deed; it brings reward to the one who performs it and there is no blame if it is not done. This is a serious misunderstanding, for in most cases in the UK, it is wājib. 2) The second misunderstanding is assuming that the obligation of Udhiyah is shared between the entire household. This results in those members of the household upon whom Udhiyah is incumbent performing just one between them, feeling that the obligation has been fulfilled. This is not so. If a man possesses the nisāb of zakāh, one Udhiyah is wājib upon him. If his wife also possesses the nisāb, she will have to perform a separate Udhiyah. Similarly, if any of the children (provided they are bāligh) possess the amount of nisāb, Udhiyah will be compulsory on each one of them as well. 3) Another common misconception is that Udhiyah is carried out to allow people to eat meat which is considered blessed. With this in mind they are satisfied with eating Udhiyah meat that has reached them from others. There is no doubt that Udhiyah meat is blessed, as Udhiyah is the re-enactment of the sacrifice made by Ibrāhīm ‘alayhis salām, the Friend of Allāh, but it is even more importantly an obligation which needs fulfilling. Such people should worry about discharging the obligation of Udhiyah and not only be content with partaking of its blessed meat. 4) In many households, the father performs Udhiyah on behalf of all his family members without their knowledge or without their having requested him. We should understand that this approach to Udhiyah only amounts to a nafl Udhiyah. In the case of a father arranging the Udhiyah for his dependants, they need to make him their wakīl (agent) in order for these sacrifices to be considered valid. It is clear from the above that we must become familiar with the masā’il and injunctions of Udhiyah. These masā’il can be learnt from various books as well as through consulting the ‘Ulamā and Muftis. Just as the name itself suggests, Udhiyah (sacrifice) should be carried out taking its literal meaning into consideration. 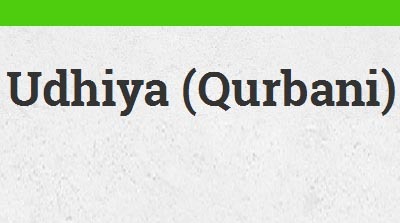 Generally, we arrange for our Udhiyah to be carried out at a cheap price in a poor country. No doubt this lifts the obligation, but it is not the type of Udhiyah that Allāh ta‘ālā would like to see. We will not experience the spirit of Udhiyah until we spend the amount that it takes to sacrifice e.g. a sheep in this country (which is often equivalent to the amount required to sacrifice a cow elsewhere). Allāh ta‘ālā has provided for us in abundance so we should express our shukr (gratitude) to Allāh ta‘ālā and not be miserly. We should offer a Udhiyah in needy countries by all means, but we should also offer one in our own locality. By doing so we too can partake of the blessed meat. Shaykhul Hadīth, Shaykh Muhammad Zakariyyā rahimahullāh used to mention that during the three days of Udhiyah, no other food items should accompany the Udhiyah meat. The Shaykh would stress to the people that during these days, they were the guests of Allāh ta‘ālā and that the meat of Udhiyah was His Hospitality. We can gather from this how much our pious predecessors gave importance to Udhiyah. So let us perform Udhiyah in our localities as well as in those places where the destitute live who have no access to meat. We should also offer Udhiyah on behalf of Rasūlullāh sallallāhu ‘alayhi wasallam, our parents, our teachers, our mashā’ikh, our well-wishers and benefactors, and also one on behalf of the whole Ummah. We may also perform Udhiyah on behalf of the various Sahābah radhiyallāhu ‘anhum, alternating between them on different occasions. The same applies for the Awliyā (friends of Allāh), the Muhaddithīn and the A’immah, all of whom we are indebted to. My honourable father, Hāfiz Ibrāhīm Dhorat rahimahullāh used to keep an annual record of nafl Udhiyahs performed on behalf of all these great personalities. He also used to perform nafl Udhiyah every year on behalf of his parents and shaykh. In this manner, our intended reward will reach the pious in the hereafter and, inshā’allāh, will be a reason for them to search for us on the Day of Judgement. We should also make this practice a habit whenever we have the opportunity to spend in the path of Allāh ta‘ālā. These acts will prove beneficial spiritually for our lives in this world and the hereafter. May Allāh ta‘ālā give us the ability to offer Udhiyah in its true spirit, not feeling it a burden but with zeal and eagerness. Āmīn.